The job board space has experienced a tremendously busy summer with the introduction of Google Job markup and significant number of acquisitions. Today, we wanted to focus on providing your niche job board with three helpful tips to optimize your job board site to compete and provide a competitive advantages in your market. As well documented within our industry, Google implemented their Google Jobs markup this summer to help better connect jobseekers with relevant job openings. At the time, Google has rolled out this functionality here in the US. From our client own results, we would highly recommend to any US job board to implement the Google Job markup as soon as possible as the increased organic traffic will be helpful for your business. Here at JOBartO, we completed the integration with Google in August and immediately saw impressive affects to the organic search results. Within the first week, organic traffic had doubled the previous monthly averages and the growth has continued since then. 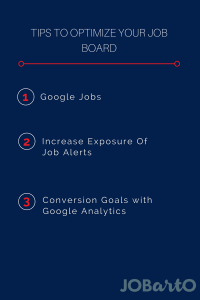 Job alerts is traditionally one of the best mechanism for a job board to re-engage website visitors and/or registered users by notifying the users of newly added job opportunities. Expanding the visibility of your job alerts is a helpful approach to increasing the effectiveness of your job site by driving traffic to the job postings upon going live. Here at JOBartO, we routinely monitor the performance of our client sites to understand user behavior to find new opportunities to help our clients achieve their ultimate goal. 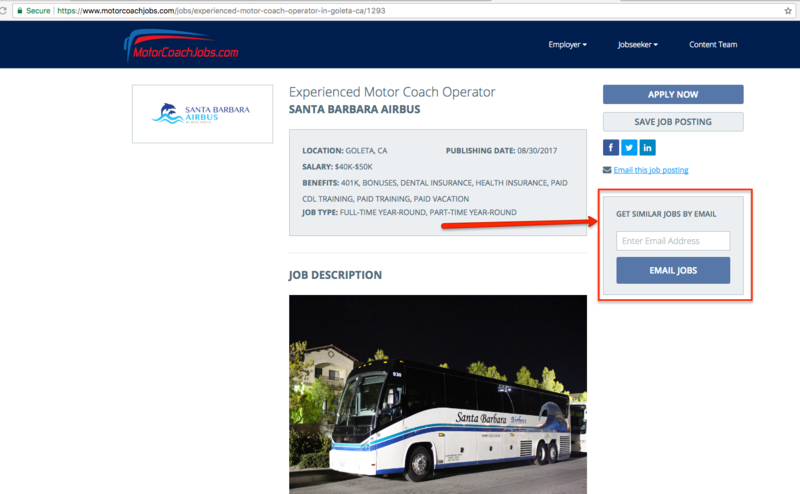 As such, we recently released two additional job alert simply registration sections on all job posting pages and ‘Featured’ company pages. Your job board may be experiencing similar results, in which, you pay job aggregators or other online sources to help drive traffic to the site that ultimately leads to the user visiting the site, but not applying or registering. Does this sound similar? We noted our clients were experiencing these frustrating effects and to help combat this problem, we added a quick and easy job alert registration section on the job posting page to help capture at the user email address to add to the job alert list. As a result, job alert sign up increased by 500%! A vast majority of job boards depend heavily on job aggregators (don’t worry, we won’t name the giant gorilla in the room, but we all know who we are referring to..here’s a hint the company name starts with an ‘I’) to drive traffic to their job board for views and applications. With the continued emergence of job aggregators like Zip Recruiter and heavier push with social media advertising in recent years, job boards have a number of sources online to advertise their jobs. Therefore, it is essential to leverage tracking codes and tools to help you track the performance of your advertising dollars and optimize your job board. If you haven’t researched the advantages of Goals, click here to check out this quick video. Goals is important because it will allow you as a job board administrator/owner to track the number of conversions, conversion rate and the ability to see which marketing campaign generates the most conversions for your business. As an example, if you are spending $500 on (Gorilla in the room = ‘I’) with a 5% application rate and $250 on Facebook with 8% application rate, you can easily modify your advertising spend. 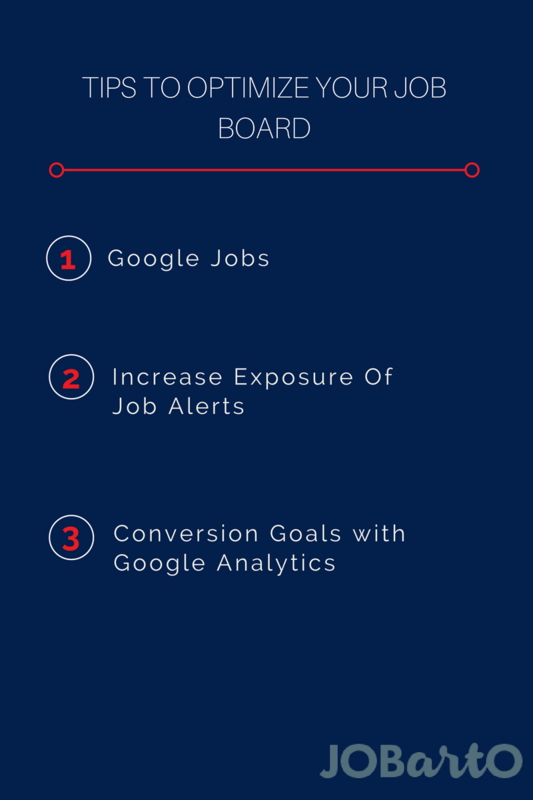 We hope these three recommendations provide you with thoughts on ways to optimize your job board and if you are interested to learn more about JOBartO and our approach to helping niche job board sites, please feel free to email or call (561) 509-5986.